The Bachelor 2015 spoilers expose the truth about who won Season 19 and why Chris Soules really chose winner Whitney Bischoff even though he will not marry his fiancee – Chris doesn’t even love Whitney! Season 19 Bachelor spoilers tease that on Monday March 9 The Bachelor 2015 finale of the reality TV dating show will air on ABC and Chris Soules will give his final rose to either Becca Tilley or Whitney Bischoff and get down on one knee and propose to the winner. Just like every season of The Bachelor and The Bachelorette in the past, the infamous blogger and spoiler guru Reality Steve leaked spoilers of the 2015 winner’s name weeks before the Season 19 premiere – and announced that Chris Soules is currently engaged to Whitney Bischoff. For weeks Bachelor fans argued that Reality Steve’s Season 19 spoilers had to be wrong – there was no way that of all of the girls that Chris had obvious chemistry with on the show he ended up giving his final rose to Whitney Bischoff. Reports emerged from various sources that Becca Tilley was actually the Season 19 winner, and Bachelor Nation was certain that had to be the case. With the Bachelor finale just a few short weeks away – 2015 winner Whitney Bischoff apparently could no longer keep the cat in the bag, or perhaps was tired of everyone saying that Chris Soules was engaged to another woman. 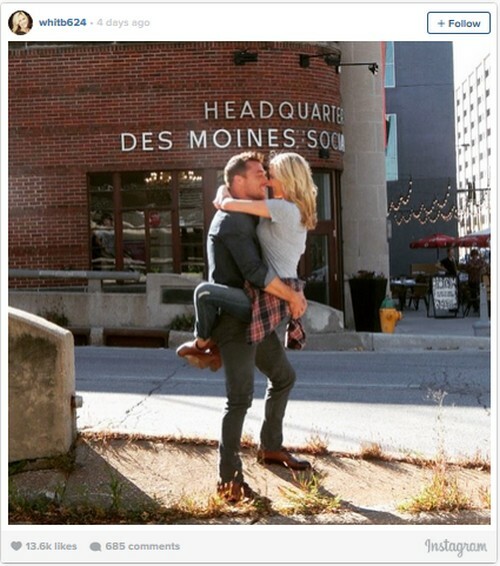 For all of the doubters out there, Whitney Bischoff took to Instagram on Valentine’s Day and posted a photo of herself and Chris Soules kissing (which we are sure the Bachelor producers seriously reprimanded her for). There really is no doubt in our minds that Chris Soules gave the final rose to Whitney Bischoff at this point – but the obvious question is… why? Not that there is anything wrong with Whitney (except for maybe her super annoying voice), but Chris had very little chemistry with the Chicago fertility nurse compared to some of the other women on the show. So, Whitney Bischoff is the 2015 winner of The Bachelor – not because Chris Soules is madly in love with her. But, because she isn’t too bad to look at and was willing to move to the middle of nowhere and start pushing out little Soules babies. Nice. Do you think that Chris would have chosen another girl to give the final rose to if someone else on the show was as ready to become a wife and a mother as Whitney was? If Britt Nilsson loved Iowa and wanted to live there – would Whitney Bischoff have even made it to the finals? Let us know what you think in the comments below and don’t forget to check CDL tomorrow for more Bachelor spoilers and news. The Bachelor 2015 Spoilers: Who Won Chris Soules Season 19 – Final Two Winner Engaged – Reality Steve Mistaken? ‘The Bachelor’ 2015 Spoilers: Who Won Chris Soules Season 19 – Surprise Winner Over Reality Steve Fiancee Mistake?